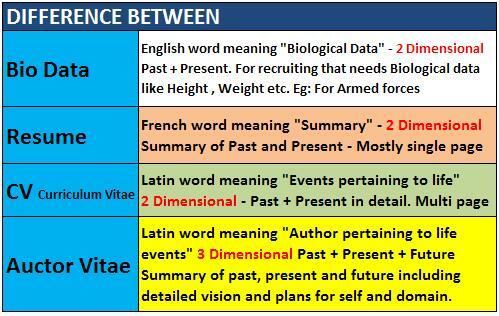 What is the Difference Between a CV, a Bio-data and a Resume? Summary of Qualifications, followed by Areas of Strength or Industry Expertise in keywords, followed by Professional Experience in reverse chronological order. Focus is on the most recent experiences, and prior experiences summarized. The content aims at providing the reader a balance of responsibilities and accomplishments for each position. After Work experience come Professional Affiliations, Computer Skills, and Education. C.V Is a Latin word meaning “course of life”. Curriculum Vitae (C.V.) is therefore a regular or particular course of study pertaining to education and life. A C.V. is more detailed than a resume, usually 2 to 3 pages, but can run even longer as per the requirement. A C.V. generally lists out every skills, jobs, degrees, and professional affiliations the applicant has acquired, usually in chronological order. A C.V. displays general talent rather than specific skills for any specific positions. What is the aim of CV? Your CV should display your talent rather than any other specific skill for specific job position. In general, CVs are used throughout most of the world, while resumes are the common format in America. However, there are significant differences between the two documents, and if you plan to succeed in the employment market it is important that you are familiar with the features and uses of both. Let’s go through them one at a time. Finally I found an article where everything explained simply and clearly. Thank you.